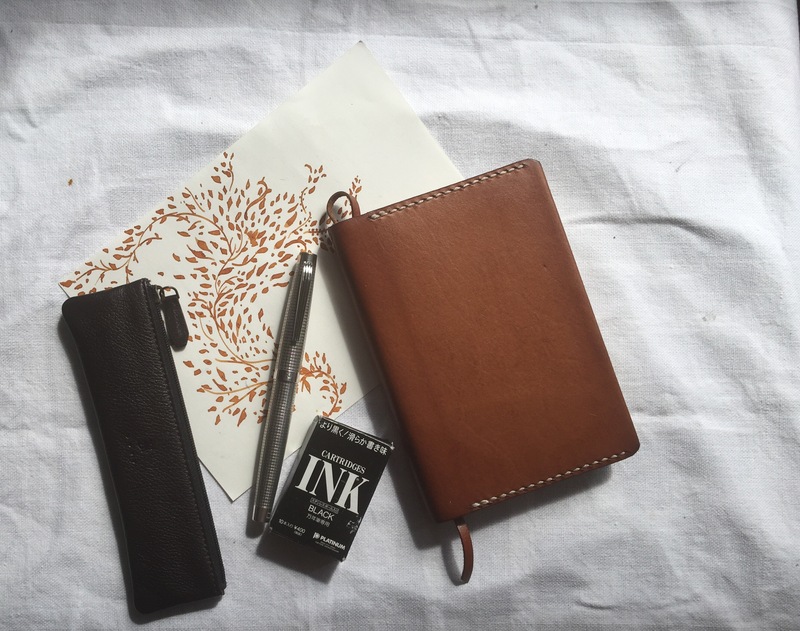 Midori’s Traveler Notebook is an iconic piece of kit. 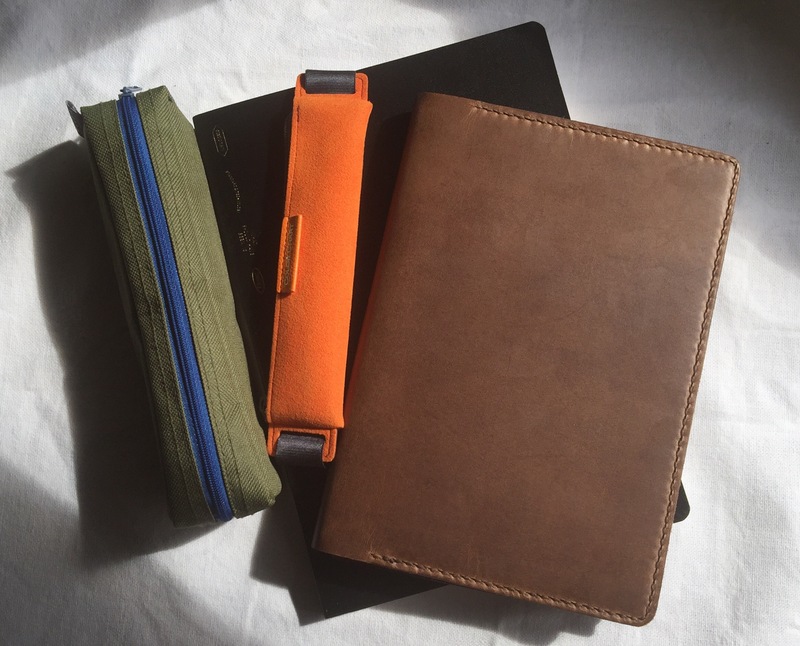 Pen geeks, paper fiends, leatherheads, journaling fans and stationery junkies all seem to have at least one of these elegantly simple notebook covers. I’ve owned a few of them myself but despite their overwhelming popularity, I think they have some serious shortcomings. 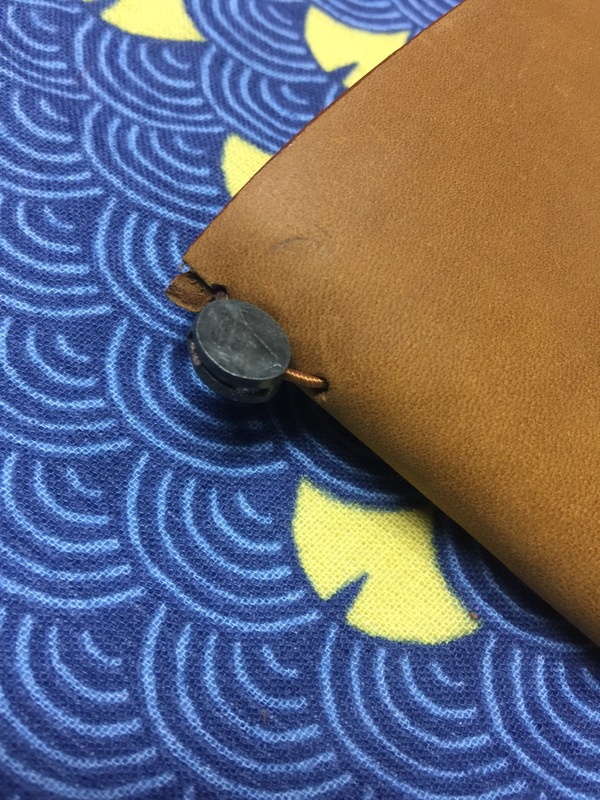 The back cover has a hole where the knotted elastic keeper slips through. 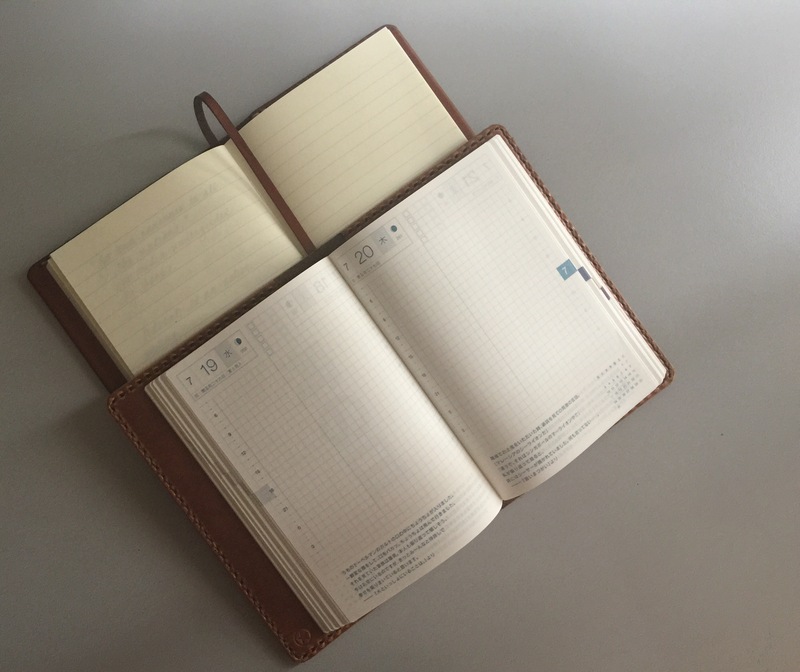 This isn’t a distraction if one has two or three notebooks installed but if you’re the type to use just one book, you may quickly feel that knot jarring your writing rhythm. Like the Princess and the Pea, some might be more sensitive to this than others. I am, and it has bugged me with every Midori TN I’ve owned. Yes, there are times when we need to reinvent the wheel. Then we have the lead crimp that affixes the elastics to the inner spine of the cover. Circular in shape, it feels like a speed bump along a road that I had expected to be smooth and cosseting. It sounds like splitting hairs but because I use the notebook on improvised writing surfaces, the crimp unsettles me a fair bit. The Midori leather seems a little synthetic. Look at how the rough side seems to have a weave to it. The grain on the finish side seems to have been machine made. Lastly, there’s the skin itself. Every Midori Traveler I’ve seen strikes a dashing pose. But the feel of the hide is a bit of a disconnect. 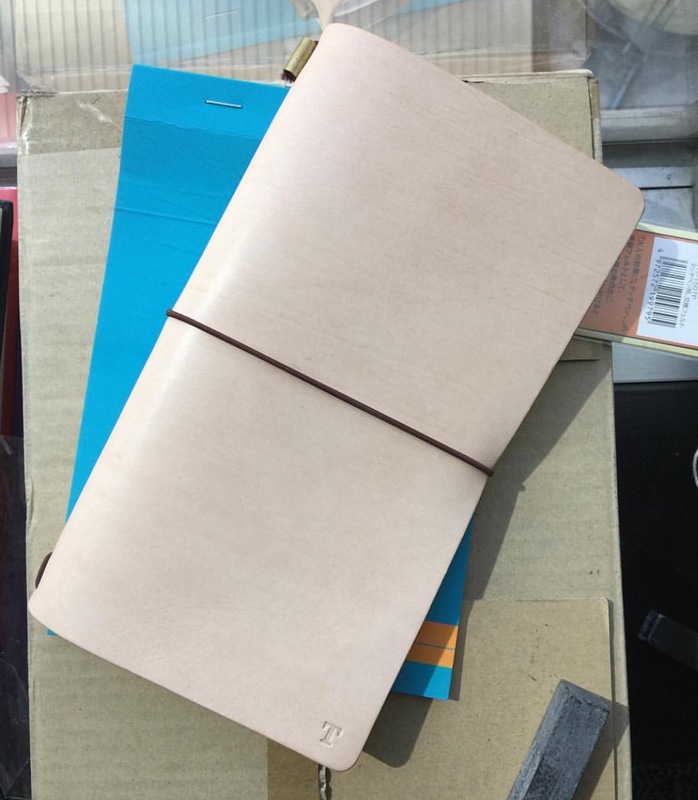 The cover is made in Thailand for Midori so I don’t quite know what exact leather they use, or how it’s tanned. What I do know is that the surface feels a bit tacky. Using saddle soap to smoothen the hide strips whatever topcoat exists. Once that layer is washed away, the leather looks and feels rougher to the touch. Not even mink or neatsfoot oil helps much and it doesn’t take a lot of conditioner to render the leather floppy. That the Midori costs a fair bit of coin aggravates the tragedy. I am not alone in making these observations. There is a burgeoning community of craftsmen worldwide offering their take on a better mousetrap, commonly called fauxdoris. 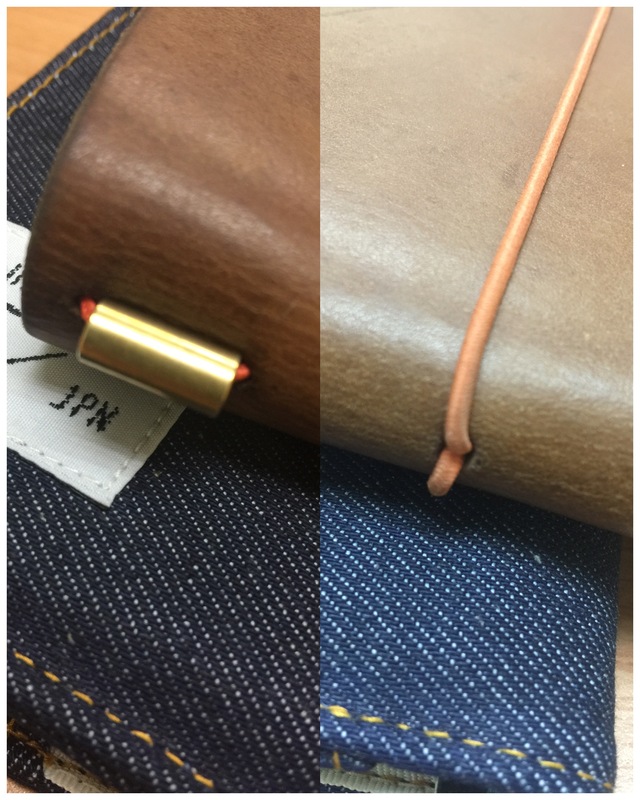 Superior hides, repositioned holes and additional elastics all aim to fix the perceived shortcomings of the beloved Japanese notebook. 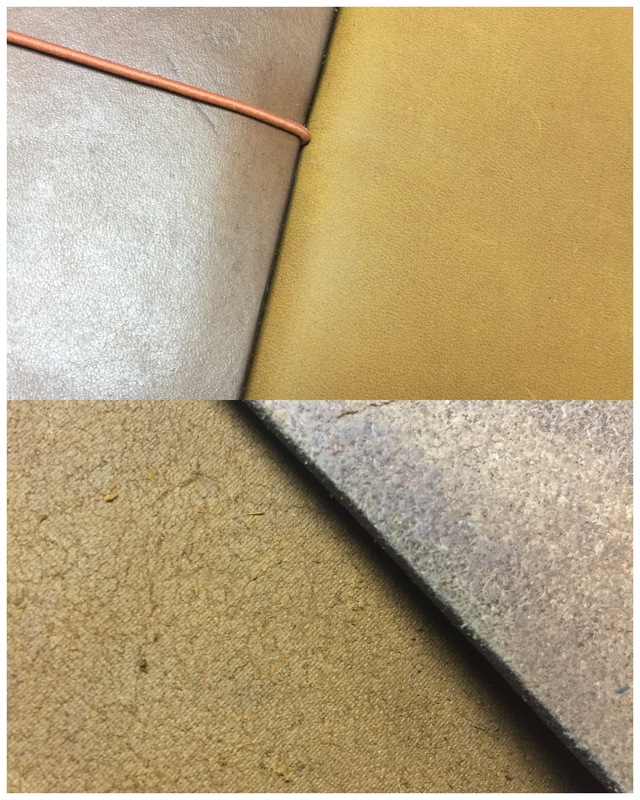 In truth, I’ve settled on a fauxdori cut from Hermann Oak veg tan leather by a Hongkong artisan. It’s better built than the original TN in so many ways, and costs less to boot. 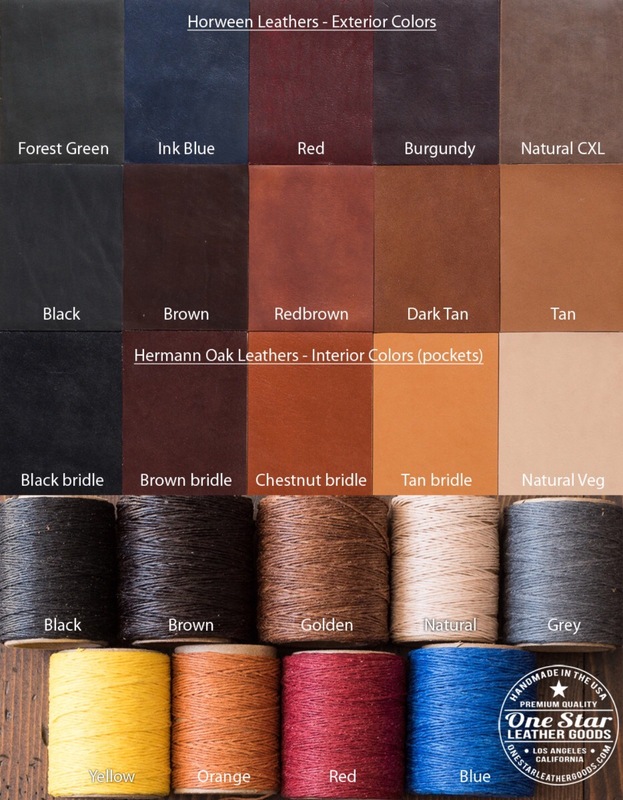 Natural Hermann Oak veg tan leather. It smells and feels a lot better than what Midori uses. The popularity of fauxdoris isn’t flattery at all but a challenge to Midori to listen to the market and step up their game. Japan’s reputation for craft is legend and I’m certain Midori can draw from this heritage to offer an unchallenged product. 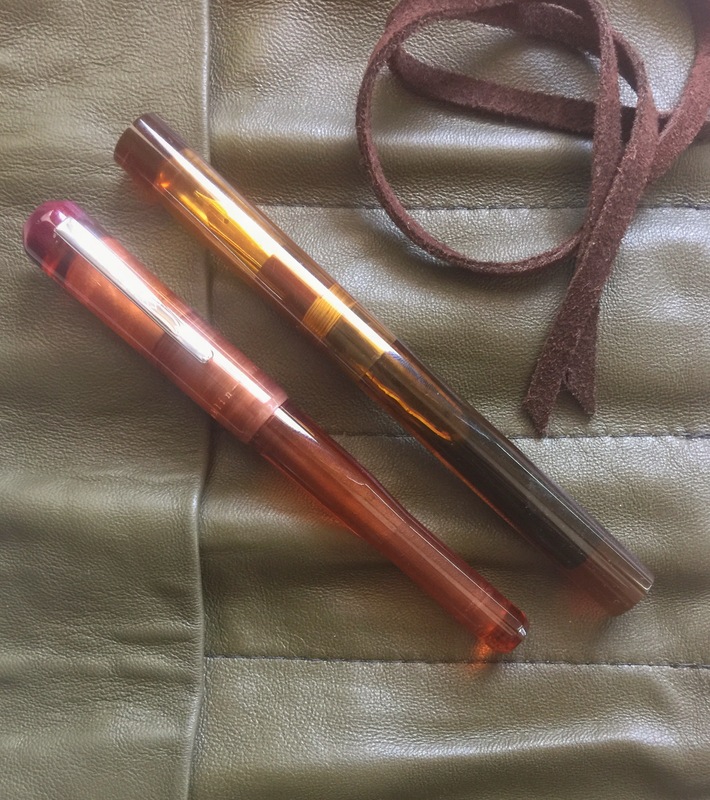 New Midori Camel on the left. 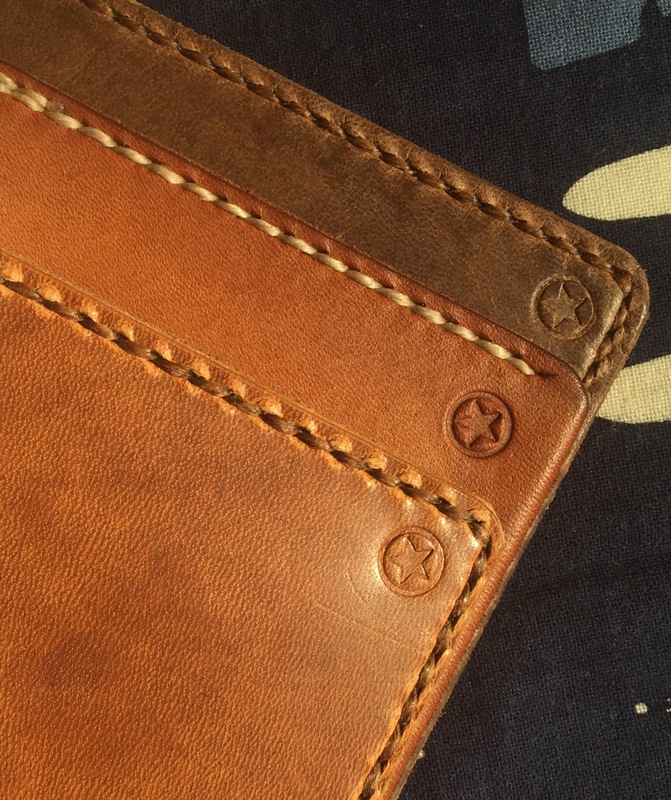 Year-old Hermann Oak veg tan on the right, by Eternal Leather Goods Hong Kong. Better hide makes for better wear over time. Ditching the crimp for a slim tube, and moving the keeper knot to the spine make a world of difference. Japanese tanneries are some of the best in the world. Their unique methods create skins that are distinctive in the way they feel and mature. Offering something cut from nume or even shell cordovan is well within their skill set. Hardware can be improved to insure the ensemble lays flat when opened. The current keeper hole doesn’t bother an Oriental language user who will open the book from back to front, but simply moving the hole to the spine will give equal opportunity to fans from the West. Will all these cost more? Without a doubt. But Midori need not discontinue or modify their existing line at all. Instead, they can introduce an upscale line to tap a market that is less hesitant to spend extra coin for a better expression of an already elegant idea. I’m sure more than a few of this blog’s readers would go for it. In five years of wading through this madness, I’ve passed through the typical stages of the hobby. 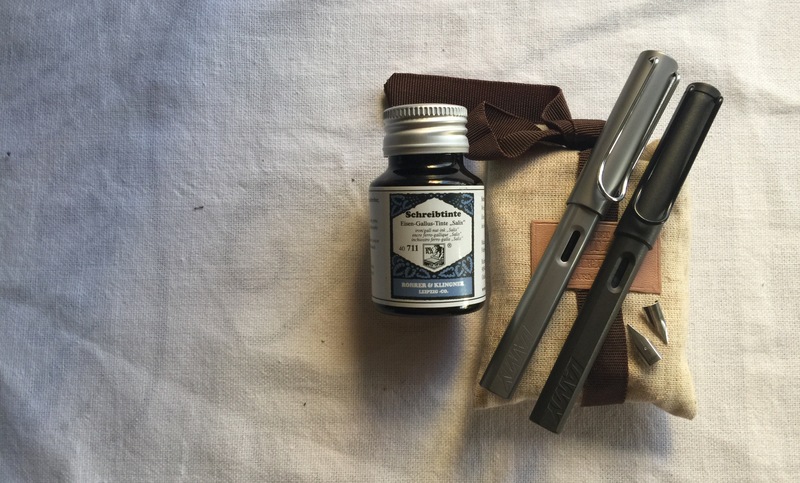 As a newcomer, I grabbed anything with a nib. Twelve months later, I ditched everything that wasn’t German. A year after that, I turned Japanese with a bit of Italian and stayed there, quite happily, until 2016 settled in. That’s when my horde underwent a reasonably radical metamorphosis. Here’s a peek at what the box looks like now. 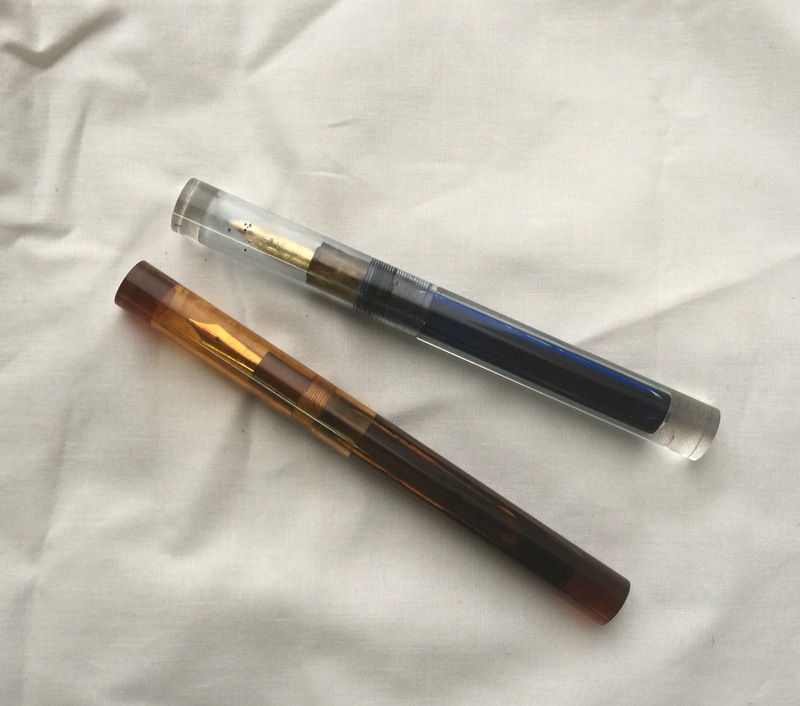 Newton Shinobi Slim cozies up to a Coco Pearl Model 03 Iterum from Franklin-Christoph. 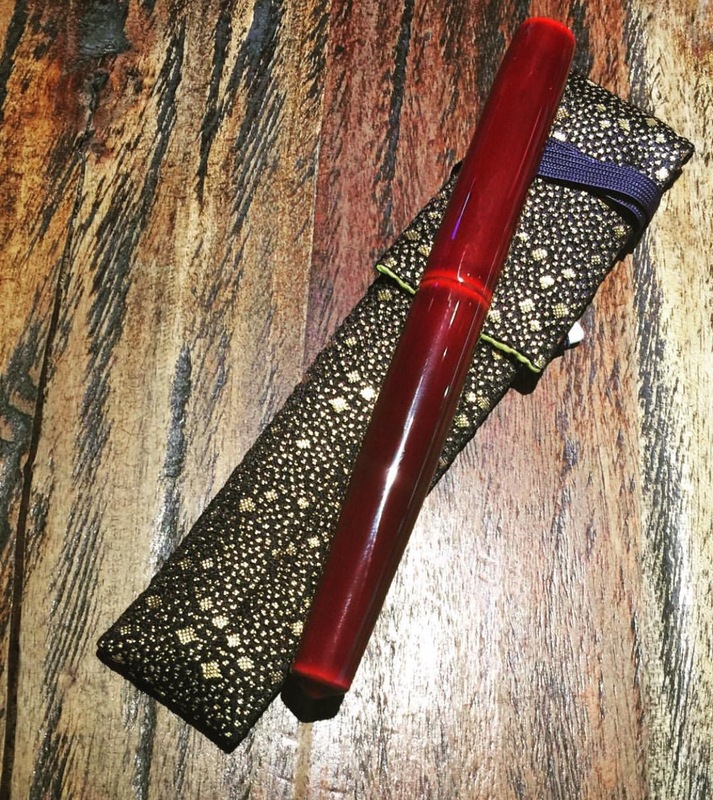 Nakaya’s Long Piccolo wears its Aka Tamenuri suit so well. The real attraction though is its Soft Fine nib. Because everyone needs a pen that’ll write from here to eternity. The birds flock for a group pic. The M120 is a daily driver. The M640 was an unexpected prize. The M415 is both a gift and a memento. Wine may age better but I can’t write with a Bordeaux. Snorkel Admiral with an X2 nib. Parker “51” aerometric with a pretty wet Medium. Platinum PP-10000 in Sterling with a winged EF. Most of these are considered small by today’s standards and only two wear a tip that is wider than Fine. All are suitable for daily driving and none will merit more than a quiet nod from an approving collector. Yet each has a story or person behind it, an encounter worth remembering. I guess this is my truest (if not criminally sentimental) measure of whatever has stayed and will stay. 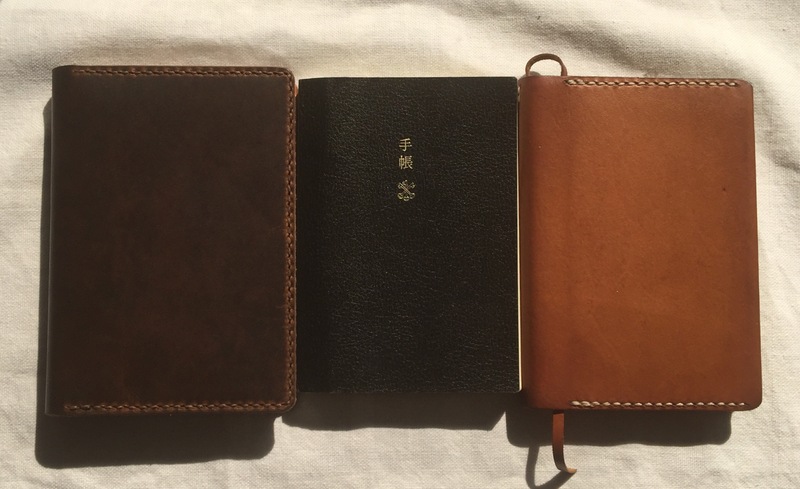 I got my first Hobonichi in December 2015. 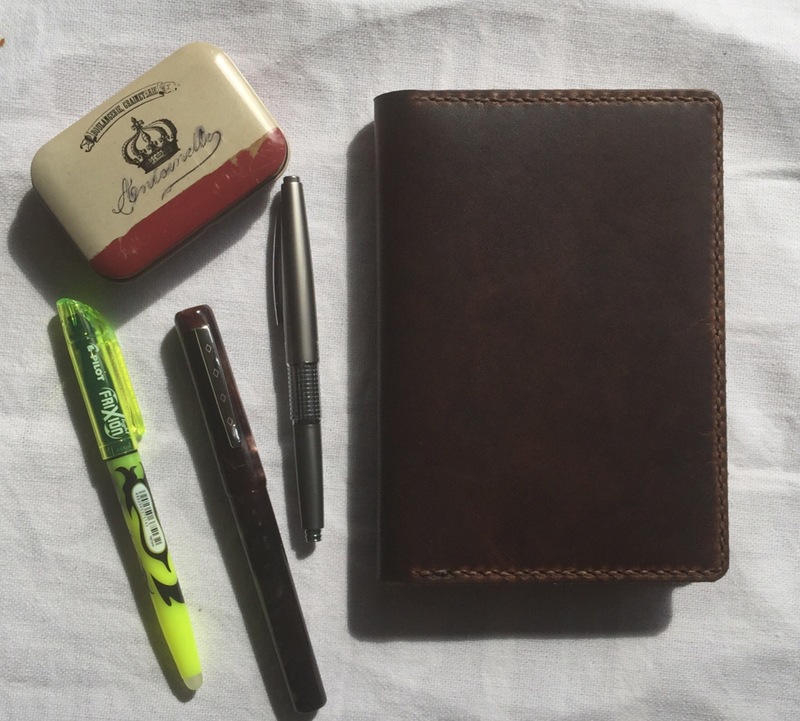 The little black book quickly proved useful but its plain, sober skin was most underwhelming. I sought better clothes and Keegan Uhl of One Star Leather Goods was the first tailor a friend recommended. The Basic is his thinnest A6 cover and I opted for natural veg tan. It started out as a pinkish beige hue but my hand oils and sunlight coaxed the leather to darken progressively. After a year of regular use, the cover now wears a caramel tone. The tan that took 525,600 minutes to achieve. If it’ll fit the A6 Hobo, it’ll take an A6 Midori MD with room to spare. 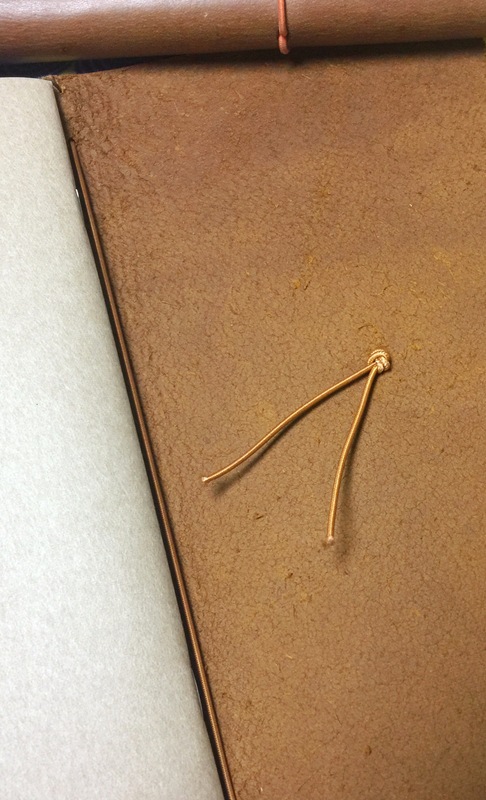 One Star can add a sewn-in bookmark to your cover, along with a few other useful options. The Basic’s slimness comes from its pattern. A single piece is cut from thin Hermann Oak veg tan or bridle, which is then folded and stitched to create the flap pockets. The Custom on the other hand, is a three-piece design that permits a thicker Horween leather to be used for the exterior. This provides additional aesthetic possibilities, and affords a bit more cushioning. The Custom on the left is just a little taller and wider than the Basic on the right. It’s hard to tell from this picture, but this dark nut brown leather has some interesting grain. This A6’s outer is cut from a Horween tannage called Dublin. It has a wonderful “pull up” or “crackle effect,” and I can’t wait to see what sort of patina it will eventually acquire. One Star normally uses bridle for inner flaps, but Keegan found some natural Dublin that was thin enough to use for this project. The results are better than I expected. Three shades of natural from top to bottom: Chromexcel, Natural Veg Tanned, Dublin. Santa, can I have a pair of boots in this shade? 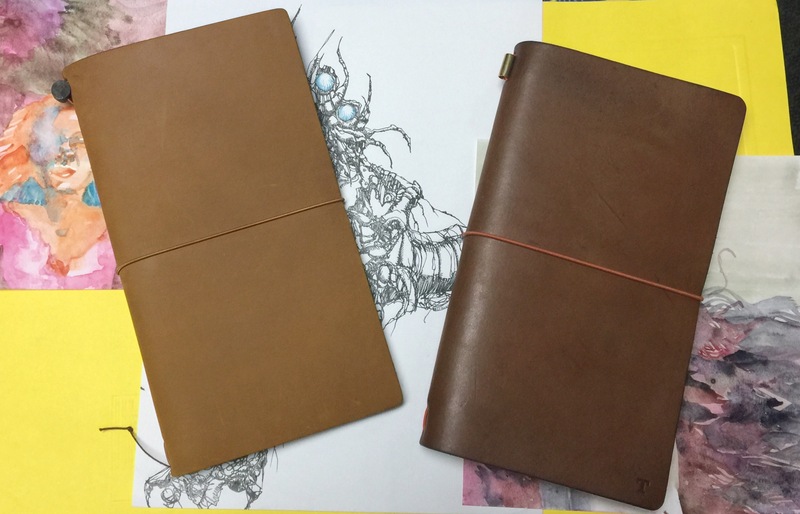 For the A5, I specified Horween’s natural Chromexcel. It’s an uncommon taupe-ish brown that features great pull up and a soft feel. Its natural hue promises that it will develop its own character as the years pass. Being a waxy leather like Dublin, it will not require frequent conditioning. A word of caution though: casing a Cousin in leather makes a heavy book even heavier. Both you and your knapsack will definitely feel the difference. I could have gotten Cordura covers for these books, but nylon shakes off yesterday’s adventures with a mere shrug. Leather picks up the stains, and scuffs, and gouges that life brings. With care and time, these blemishes adorn the skin with every memorable stop on the user’s life journey. They prove that scars and blows don’t truly deface the object, but instead peel off the scales to release the soul lurking within. 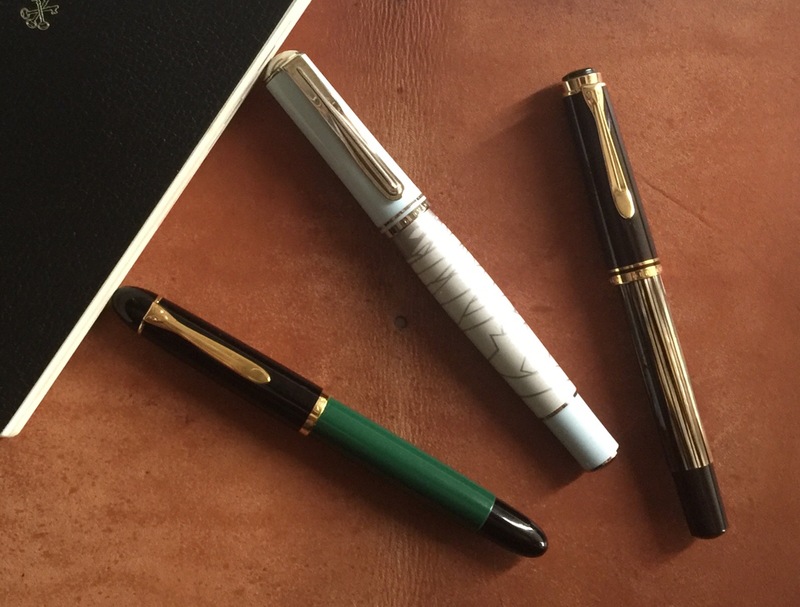 FPN-P, the pen club I belong to, wrapped up its Fountain Pen Day celebrations a few weeks ago. Seven of the country’s foremost vendors of writing tools set up shop to present their offerings to a visibly interested public. It was great to see many young people happily walk away with a bag or two of purchases. As organizers, we try to show our personal gratitude by patronising each of our generous sponsors during the show. In going about my duty, I decided to support our local Lamy distributor by purchasing two popular gateway pens: the Lamy Safari, and Al Star. I once blogged that the Safari may be the best set of training wheels for someone new to nibs. I still believe this to be true, but wondered if the years may have altered that opinion. My first Safaris (ca. 2012) struck me as dry writers and the nibs weren’t always smooth out-of-the-box. With 2016 being the 50th anniversary of Lamy Design, I was curious to see if these current productions gained an improved build. Neither suffered any ill effects from an iron gall diet. For this experiment — that’s my story, and I’m sticking to it – I chose an ubiquitous matte charcoal Safari, and a graphite Al Star. Both came with Fine nibs but I was surprised that they wrote as wide as the Mediums from four years ago. The tipping appears to be within spec for Fines, so I assume better ink flow is what caused the lusher lines. Both pens draw from the same DNA pool even though the Al Star is clearly the more upscale option. While the Safari is molded from ABS plastic, the Al Star is machined aluminum with an anodized finish. The Safari is slightly slimmer though you won’t notice that until both models are side by side. The Al Star’s section edges feel less sharp than the Safari’s, and despite being made from metal, the Al Star isn’t that much heavier than its resin predecessor. You either learn to love this shape, or banish it from long-term memory. The section flats are what make the Safari/Al Star a rather painful experience for a beginner. Even more experienced hands can sometimes disagree with how the pen wants to be held. While I wrestled with this shape in my early days of learning, it now felt logical if not familiar. A bit of Scotch tape is all you need to make the switch. The nibs won’t cost you much either. 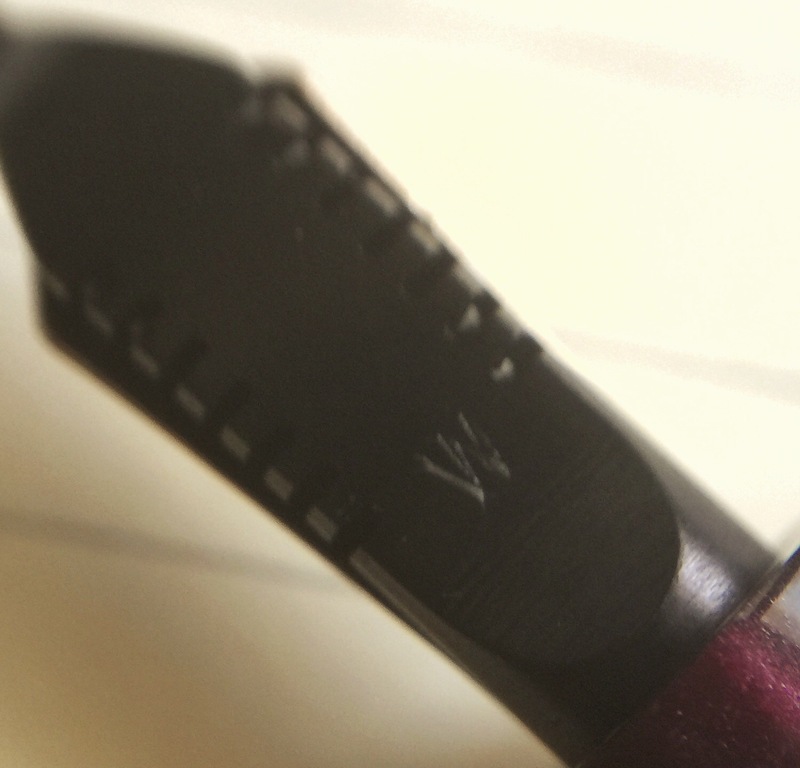 One of the pen’s strong points is its inexpensive and easily interchangeable nib. Naturally, nibs at this price point are mass-produced and aren’t perfect. Slits are typically off-center but if the tines mate properly, the pen will be smooth enough for government work. 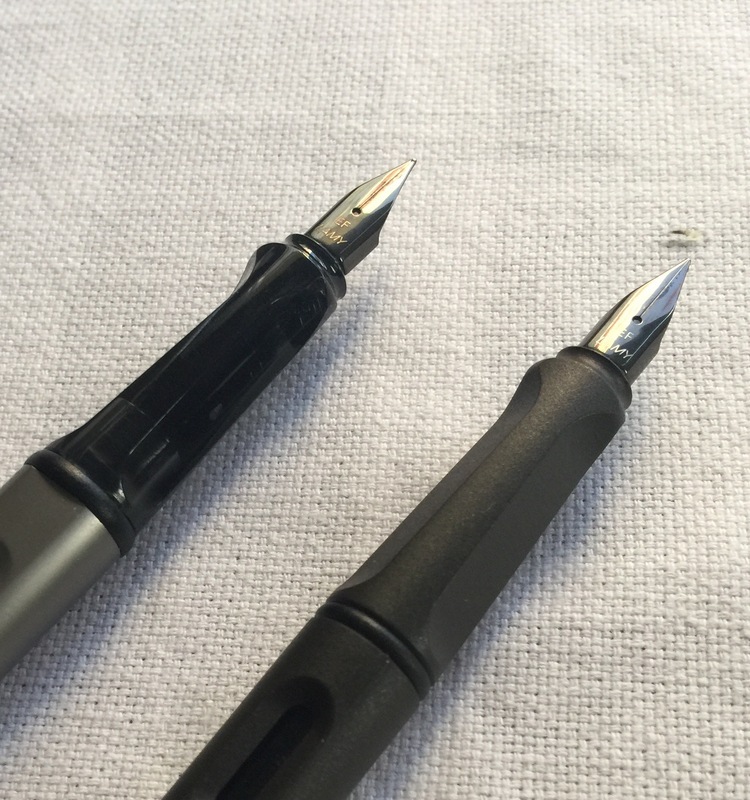 I purchased a pair of black EF points, as well as a 1.1mm italic. All wrote well, with none ever feeling dry or rough. Because these are daily writers, I left the EFs mounted and soldiered on. These Lamys aren’t the prettiest pens I have, but that’s okay. 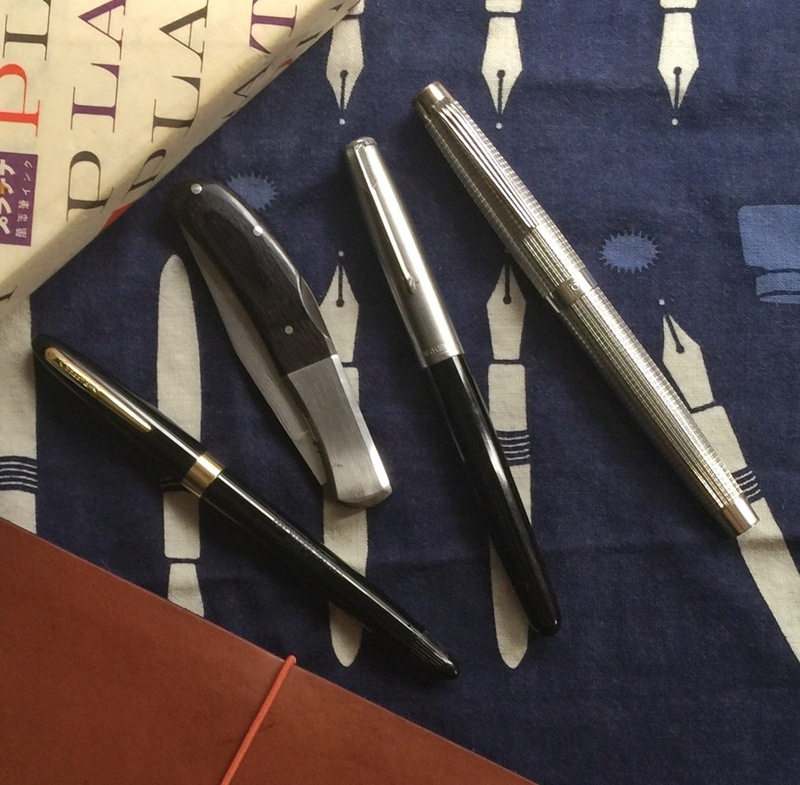 All of the pens I kept after five years in this hobby have a profound story, and I’d hate to lose any of these cherished memories. It is certainly refreshing to have simpler tools on hand – sterile things that work uncomplainingly well and are easily replaced should they fall to absentmindedness or misfortune. 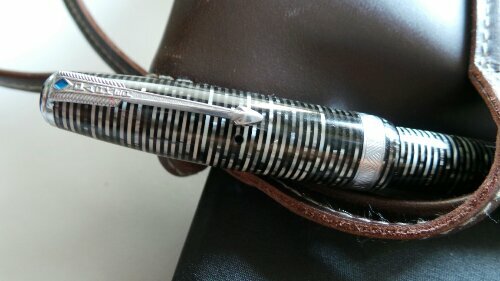 One of my best writers is a gray striped 1939 Vacumatic Long Major. It was Enabler’s birthday gift to me some three years ago, and sports a rare factory stub. Trouble was that it busted its diaphragm annually, often at the worst possible time. 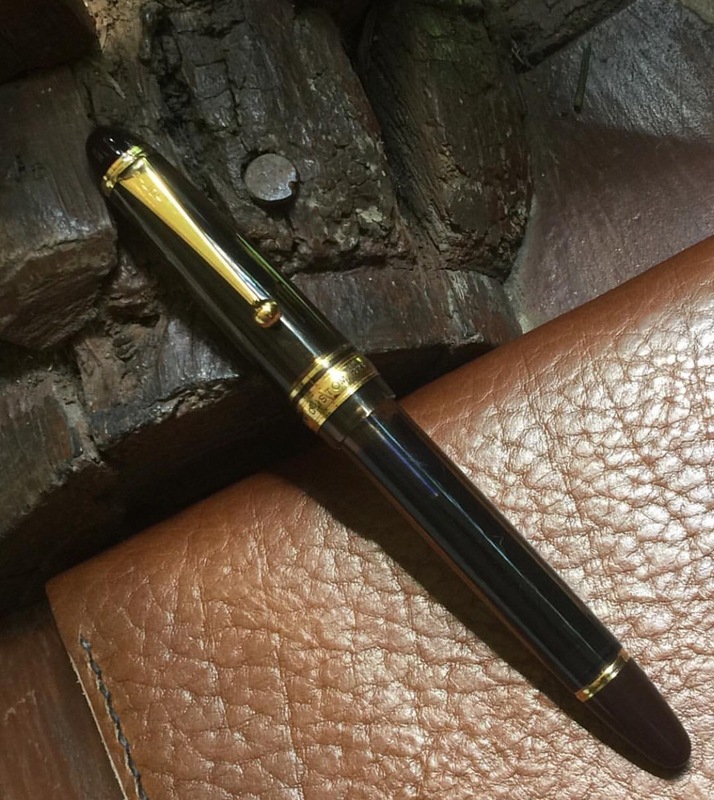 I really didn’t want to deal with sacs and such anymore, and decided a custom pen built around the Parker’s nib might cure my pains. 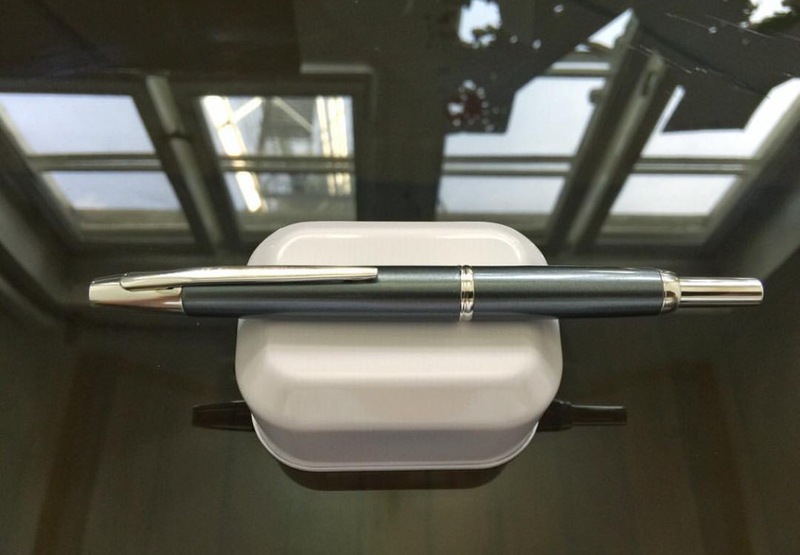 This was the donor pen, a birthday present from 2013. Many pen friends loved and owned Shawn Newton’s work, so he was the only craftsman I looked up. Going through Newton’s site, I saw that he makes anything a reasonable customer could want. After measuring dimensions of the pens I tended to use most often, I had a clear idea of what I wanted him to build. I asked for an eyedroppered Shinobi in slim size, long length, with a subtly pinched grip section. For the acrylics, I chose a translucent amber tortoise for cap and body, paired with an opaque wine red swirl for the section. As we finalized details, I decided to have a second section made for a Platinum Century EF nib and feed. The nibs were mailed to Arkansas, and the wait began. 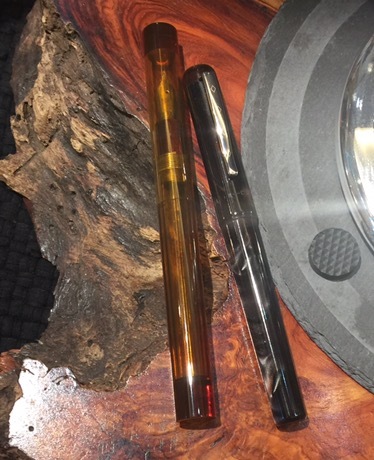 Four months later, Shawn sent me pics of the pen taking shape. Within a day, it was completed and not long after, began its trans-Pacific voyage home. I don’t have a balcony so the training wheels option will have to do. Regular vs Slim. Choose what fits your mitts. Shawn warned me that my stub had a minor tine alignment issue, so the first order of business after unboxing was to pull the nib and balance the tines. Fifteen minutes with a loupe and a gentle touch proved adequate. I inked the pen with Sailor Rikyu-Cha and let the rubber meet the road. The stub that started this whole project. You don’t find too many of these in the wild. I had forgotten how wet this nib is! 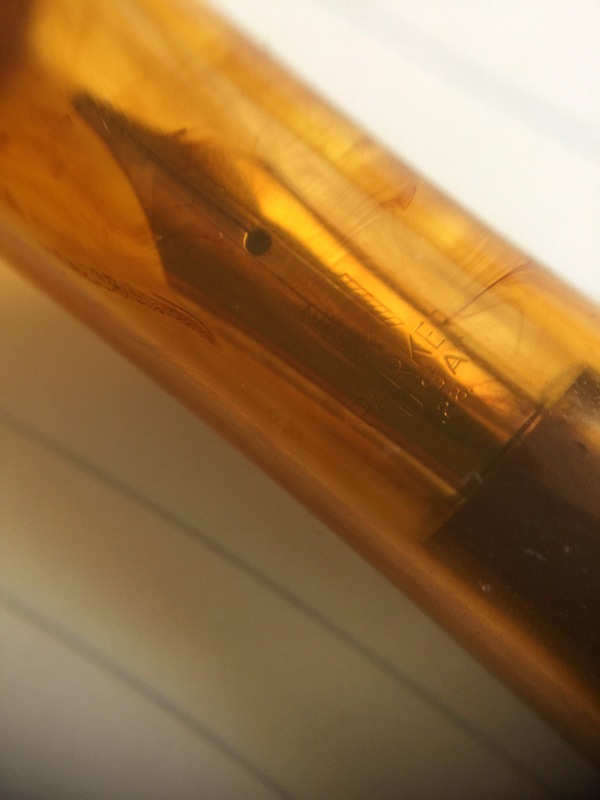 Rikyu-Cha usually dries to a bronzed tone of brown but in this pen, it went down like dark chocolate and stayed that way. Califolio’s blues are typically subdued so I tried Botany Bay next. Again, the ink dried darker than usual. I decided to go with my current fave, KWZ Gummiberry, and was met with lines as dark as Diamine Eclipse. More my speed. 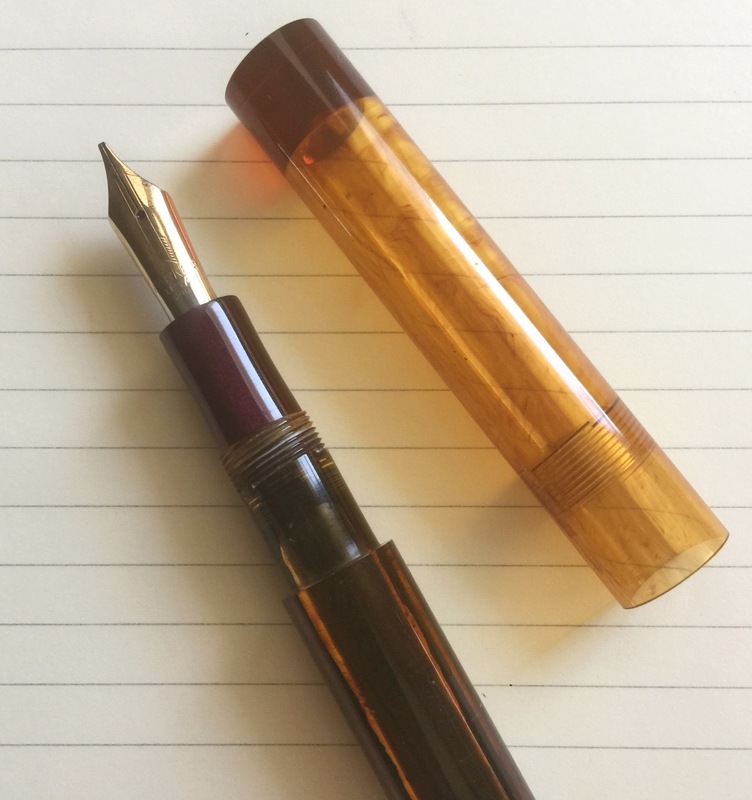 This might be the beginning of an amber demonstrator kick. Handling is excellent. I worried that the step in the barrel might prove discomforting in use. It does not meet the web of my hand so I don’t feel it while writing. The section welcomed my grip like an old pair of loafers and overall balance (with a full tank of gas) was just perfect for me. That step in the barrel is never felt. Like a true Shinobi.